The third annual CISRS Instructors Conference took place last weekend, at the Birches conference centre, National Construction College East, Bircham Newton, Kings Lynn. The event was heralded a success by CISRS scheme management and the 40+ delegates in attendance. The vast majority of delegates arrived on site on Friday for an evening meal and drinks prior to a busy day of discussion & presentations on Saturday. The event takes place at weekends in order to limit disruption to the training schedules of the instructors. The conference was chaired by Scheme Manager, Dave Mosley who spoke on CISRS standardisation particularly in relation to the recent changes to the Part 2 training package, CPD for Scaffolders, which is to be introduced in 2017. 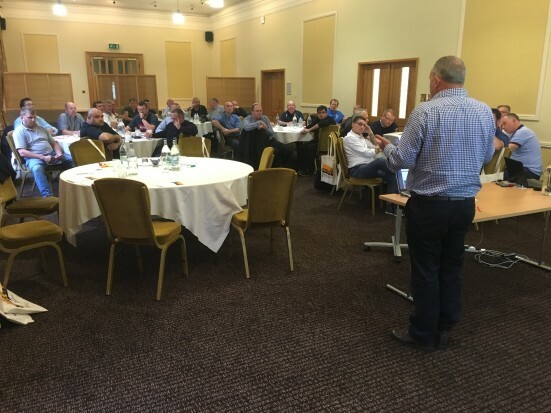 He also faced an open Q&A session at the conclusion of the conference fielding a series of questions from the instructors, leading to an open exchange of dialogue on scaffold training and the CISRS scheme. CISRS Scheme Manager, Dave Mosley said: “As with previous events, there was some lively debate and difference of opinion on some issues – but I do think having these conversations is an important thing to do. Other speakers at the conference included: Ex-NASC President and CISRS representative, Bob Whincap who covered CISRS scheme rules and instructor responsibilities. Tony Barry (Senior Instructor at NCC Midlands), who previewed the work carried out so far by the CISRS standardisation Group on the Advanced programme and Simian Risk Management Limited MD and Temporary Works Forum member, Simon Hughes. He discussed how temporary works procedures can apply to the scaffolding sector and plans to introduce more information surrounding this topic into the CISRS training scheme. To obtain free copies of the CISRS General Information Booklet, ‘Have You Got The Right Card?’ CISRS poster, or any other relevant CISRS information please visit www.cisrs.org.uk or email enquiries@cisrs.org.uk.